If you missed Hall of Judgment – the first third-party supplement for the Dungeon Fantasy Roleplaying Game – during its successful Kickstarter, the full-color softcover is now available from Warehouse 23 (joining the already available PDF). Announced on April 1, 2018, Hall of Judgment was greeted with whispers of anticipation alongside concerns that SJG was teasing folks with a sure-to-be-a-joke offer of third-party support. But no one was joking. What started life as the Lost Hall of Tyr adventure (for That Other Game) was expanded, refined, and enhanced by publisher Gaming Ballistic, growing from 64 to 128 pages. Its Kickstarter ran from June 19 through July 14, raising over five times its goal. The PDF arrived to backers on August 10, followed shortly thereafter by physical copies – full-color on high-quality paper, lavishly illustrated, and matching the 8"x10" dimensions of the Dungeon Fantasy boxed-set books. 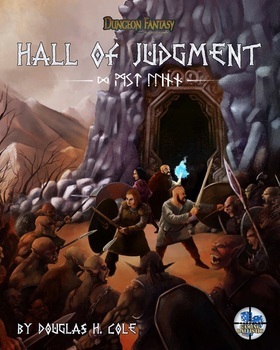 Hall of Judgment features a fully fleshed-out, Viking-flavored town, the main quest, three side quests, and dungeons illustrated by Glynn Seal (2018 ENnie winner for Best Cartographer). It also contains simple grappling rules, wilderness survival, suggested encounters, 30 new creatures, and 16 pre-generated characters. The best dungeon adventures hint at other possibilities, and that's true with Hall of Judgment. If you hop over to Warehouse 23, like what you see, and want to encourage further Dungeon Fantasy developments, then pick up a copy (PDF or print! ), tell your friends, and keep your torches lit. With the right momentum, what seemed impossible could come true, and future fantasies can become reality.